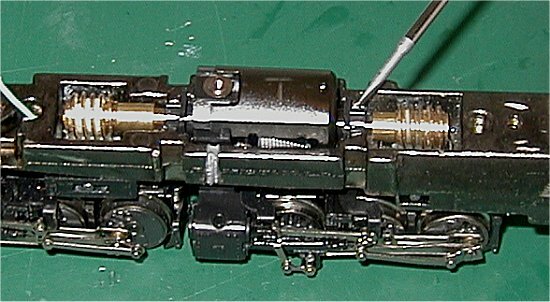 This project will be a Con-Cor Challenger with the GHQ pewter boiler and details to make a convincing model. It may take some time because I am having problems getting my Con-Cor Challenger to run worth a darn. In the picture below I have found one of the problems. 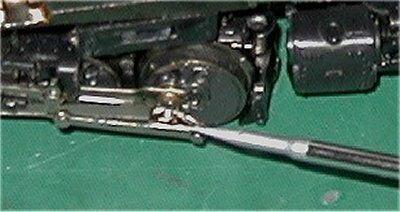 There is a screw head that shows rub marks, ro I slightly bent the drive rod so it would not rub. This seems to have fixed the hitch in it's giddyup but overall running is still very poor. In this picture I am turning the motor by the worm gear and I detect some kind of friction. 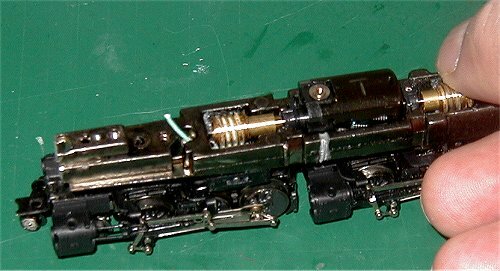 The motor should be free turning. I think the plastic motor bearing fits too tight and is pinching the shaft. I have carefully removed some of the metal frame with a Dremel so the bearing fits a little looser. At this point the motor turns a little easier by finger, but it still has too much friction. I'm looking into this before I continue.